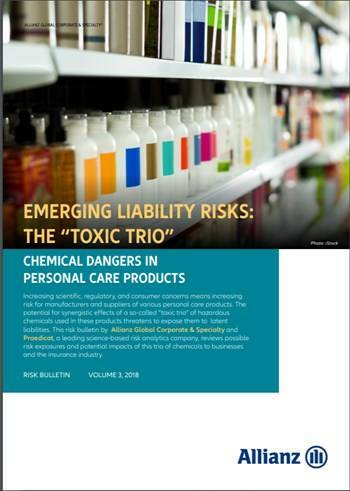 Emerging Liability Risks: The "Toxic Trio"
Increasing scientific, regulatory, and consumer concerns means increasing risk for manufacturers and suppliers of various personal care products. The potential for synergistic effects of a so-called “toxic trio” of hazardous chemicals used in these products threatens to expose them to latent liabilities. This risk bulletin, prepared by Allianz Global Corporate & Specialty and Praedicat, a leading science-based risk analytics company, reviews possible risk exposures and potential impacts of this trio of chemicals to businesses and the insurance industry.